Watershield is a rooted plant that floats on the surface similar to water lilies. 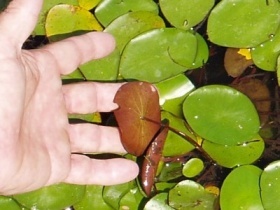 However, the leaves of watershield are much smaller than those of water lilies. Watershield leaves are typically between one inch and two inches across. Early in the season, Navigate is an effective control solution. However, as the season progresses, watershield will typically form a jelly-like gel on the underside of its leaves. Once this gel has formed, a much better solution is to spray the plants with our Watershield control products.